Cheim & Read is pleased to announce an exhibition of Nightclub Portraits from 1973 by William Eggleston. These large-scale black and white photographs are being shown for the first time and represent a unique project for Eggleston. Walter Hopps writes that the portraits were taken "with an unusual 5 x 7 camera" and an umbrella flash. "With it, Eggleston could shoot in virtual darkness in the juke joints and clubs around Memphis. The portraits are offhand and spontaneous but insistently stark; their brutality is heightened by the absence of color." "The portraits also have a leveling effect-whether biker or debutant, the people Eggleston photographed are clearly denizens of the same realm. (He) is reminding us: look closely, each of these individuals is subtly different." In the front gallery Cheim & Read presents Marvin Israel's Black Paintings. "A highly respected and influential art director, a designer and teacher, collaborator with, and friend to, Richard Avedon and Diane Arbus, Marvin Israel was first and foremost a painter. His one-man exhibition at Galerie Arnaud, Paris, 1952, preceded his exploits in the New York magazine world, and painting continued to be the creative bedrock for all his other activities. But while they reflected his interest in gestural abstraction and other current modes, his paintings could not be claimed to be significantly innovatory–until 1971. This was the pivotal year in Israel's career, the moment when he appears to have seen how to forge an individual style, an expression based partly on inspirations (for example, Goya or Daumier) he had absorbed long before. He abruptly abandoned the fusion of late-Pop and Surrealism, painted in boldly-colored crayons or acrylics, he had premiered at the Cordier & Eckstrom Gallery in 1966 and switched to large-scale, low-key drawings on paper, rendered in charcoal and pastels. The subject matter of these somber monochromes changed too, and this probably reflected his study of ethology and his interest in the ideas of Konrad Lorenz. Certainly, Israel embraced the anthropomorphic aspect of the large dogs that preoccupied him for the next two or three years, and which formed the basis of his next solo exhibition in New York. Some viewers found the imagery in Israel's 1974 exhibition shocking, and Hilton Kramer's description of the encounters between pairs of dogs as 'vicious' was typical of a more widespread reaction. Kramer did, though, recognize that Israel's artistry was 'utterly astonishing', and that the 'draftsmanship and the virtuoso rendering of light and shade are the work of a master'. 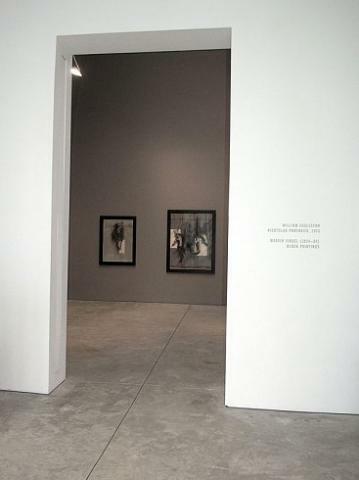 The perception that the dogs were engaged in acts of violence is redolent of the generalized responses to the work of an artist Israel greatly admired, Francis Bacon; it is similarly misplaced in the case of Israel's drawings, which in most cases depict aggression only as a subtle undercurrent. In fact his canine alter egos (he called his own dog Marvin and admitted that the dogs in his paintings were metaphorical self-portraits) are equally capable of conveying more complex and ambiguous emotions, something closer, perhaps, to a rough, equivocal affection. Radical as Israel's transition was, its figural dramatics undeniably placed him outside the contemporary avant-garde cultural mainstreams of minimalism and conceptual art. During the remaining ten years of his life, although he made minor technical modifications (such as the highly effective use of thinned oil washes), he remained uncompromisingly wedded to his powerful, but unfashionably figural, iconography. Legendarily irascible, Israel may have felt out of step with his time: it is encouraging that the times have caught up with him, and the graphic eloquence and poignancy of these marvelous drawings is at last being widely recognized."